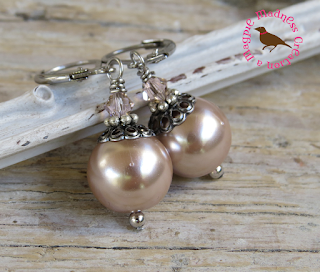 Soft and feminine, these dusty rose glass pearls are are topped with an antiqued pink Swarovski crystal and antiqued silver filigree elements for a decidedly delicate, light weight pair of earrings. The wires and pins are surgical steel for long wearing and those in our midst who have sensitive ears. Like them longer? Use option at checkout to choose this longer pair. You can find these antiqued pink pearls here!